Bring out the flavor in your food. The right amounts and blends of salt 'n pepper will render you a culinary artist at every meal. Additionally, nothing complements a set table more than a smart pair of salt and pepper shakers. ✔The salt grinder and pepper grinder are both built with an adjustable ceramic grinding mechanism that allows you to manually choose the coarseness of the seasoning, ranging from fine to coarse. ✔The grinders sit upright on the glass sphere base; the seasoning never leaves a mess on your table or counter. ✔With covered lid caps, our salt and pepper grinders keep your spices fresh longer. ✔ A Gold Armour salt and pepper grinder set in the stainless finish will fit well in nearly all kitchens. Say goodbye to your old salt and pepper shakers! ✔ Easy cleanup! Simply unscrew the bottom glass sphere and hand wash the grinding mechanism and the glass sphere with a mild soap. Whats in the "The Gold Armour Salt and Pepper Mill Set" Box? 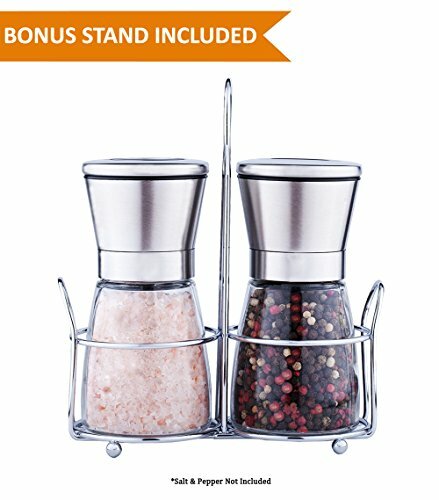 ✔HIGH QUALITY ADJUSTABLE GRIND SETTING: This Salt and Pepper grinder set comes with adjustable ceramic grinding mechanism which allows you to finely crush, mill and grind your spices from a fine to coarse. To adjust the coarseness, you just turn the black knob on top of salt or pepper mill, hold the head and twist the glass body, and then enjoy fresh grounded salt, pepper or other spices. ✔90-DAY MONEY BACK WARRANTY: We proudly back your purchase with our exclusive satisfaction guarantee. If anything goes wrong with your new 150 ml salt & pepper mills, return them within 90 days for a full refund. ✔100% SATISFACTION GUARANTEED: If you aren't 100% satisfied, just contact us! We promise your money back or replacement with no questions asked or charge. Order now. ✔EASY TO REFILL: No need to constantly refill anymore. Each grinder fits in your hand with a perfect size of 5.2 inches tall and holding 150 ml of spices, ensuring long-lasting use without refilling and being bulky. Clear glass jars indicates when it is time to refill. Just simply screws stainless steel top off the wide opening, and refill it easily with no mess.